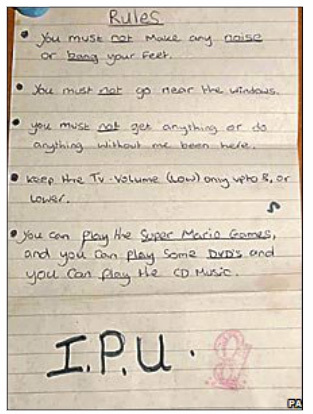 This was a set of instructions devised by a kidnapper to keep a 9 year old under control while he was out. The abbreviation 'I.P.U.' turned out to be, rather simply, 'I promise you'. The notes turned out to have been written by the child's mother, who was in on the conspiracy. She frequently used 'I.P.U.' as a threat. This is an interesting example of what linguists refer to as the 'pragmatics' of language - where the meaning of a word comes from the context and not the dictionary sense of the word. The word 'promise' here is highly significant in helping us to understand the relationship between the mother and the child in this instance.